In this post we are going to take a look at a basic skin care guide for your dog. 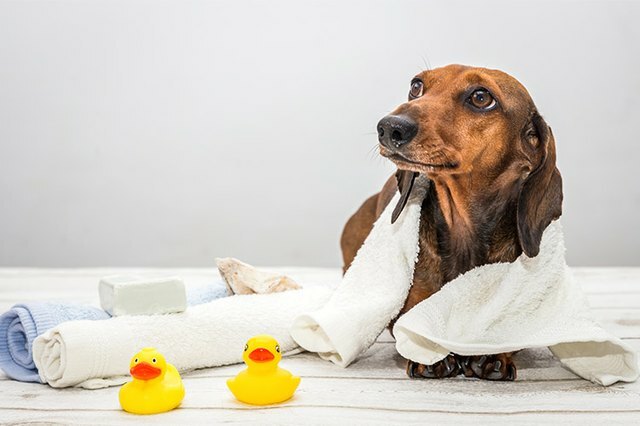 Taking care of your dogs hygiene, keeping them nice, clean and healthy will protect them from things like dry skin, skin infections matted coats and all other related skin conditions. As much the same as with us, preventive precautions far outweighs the problems it can cause down the line. For best results feed your dog quality food and void artificial bulk manufactured crap can foods. Feed your dog can food every meal is like you living on a can of spam or other processed foods that has no goodness or nutrition in it. All that stuff does is fills a hole in the stomach for the night and make a turd out of the next day. No value what so ever. You can click here to get some free homemade doggy meals that are simple to make, better for your dog and will have your dogs skin shining and looking the best its ever been. If you still persistent in buy commercial foods, look for stuff with mega-3 and omega-6 fatty acids, as they are necessary for proper skin and coat health. At the bear minimum try to avoid chocolate, avocado and these other foods. The shampoo that we use isn’t the best to used on your pooch. Without getting all nerdy its all got to do with pH levels and alkaline. In a nutshell our shampoo is designed for pH levels 5.2 to 6.2, on the acidic side where dog’s pH level falls between 5.5 to 7.5 — more of an alkaline concentration. Do check the labels for the pH information, as well as for artificial fragrances — to be avoided — and look for all-natural skin moisturizers, such as vitamin E or aloe vera. Dogs can’t talk, and we all know that. Due to that, we need to be observant with their actions. A dog can also feel ill, but of course, it can’t voice it out and just tell you that they are feeling sick. Here are some signs that you can watch out so you would know if your dog is not feeling alright. You have been with your dog and with that span of time, you know their daily routines or what is it exactly that they do on a regular day. If you notice that your dog seems different, make sure to check on them immediately. It can just be nothing but most of the time something doesn’t feel right at that point. Dogs love to eat so you better check on your dog immediately if all of a sudden they lose interest in food. What you can do is bring them directly to the nearest veterinarian to get them checked. Loss of appetite is a symptom to numerous dog ailments. If your dog suddenly decided that they don’t want to drink water, get your keys and start driving towards your vet. It can dehydrate your canine friends immediately if they don’t drink water. As a matter of fact, you should be more alarmed if they are not drinking than if they are not eating. If a dog vomits, we usually don’t pay enough attention because we think it is just normal for them to do that from time to time. It is true, but if will notice that the dogs keep on vomiting, bring it immediately to a canine doctor. It needs to be checked because some serious illnesses can cause it. The dog is your responsibility, so you need to make sure to keep an eye on your dogs if you see something that is beyond its routine. Have an I.D. tag on your dog at all times! We cannot stress how important this is. Make sure the tag has current information and more than one contact phone number if possible. The word ‘REWARD’ right on the tag might help get back a dog that someone else may be tempted to keep. Keep current pictures of your dog in his vet record file. If your dog has a medium-or long coat, take pictures both with and without a haircut if possible. If you would hardly recognize your Old English Sheepdog after he’s been clipped, how would anyone else? Keep a list of local shelters and rescues in your pet’s file. If you must go out of town for a short time, we recommend kenneling your dog rather than having a friend pet sit. Many of the calls we get about lost dogs occur when someone else is watching the pets or the house. Your dog may miss you more being kenneled, but if it’s only for a few days you will enjoy your time away more knowing that your pet is safe and secure in your absence. If you do decide to have someone pet sit in your home, make sure they are experienced and check their references. Unless you have gone through several levels of obedience with your dog, we recommend never letting your dog off lead in an unfenced area. Even the most well-trained dog may not be able to resist that squirrel running across the street or a whiff of an alluring scent. A dog off lead is as risk for getting lost, stolen or run over by a car. A $5 nylon lead will do much to ensure your dog’s safety and give you peace of mind. Make sure that your dog’s collar is snug enough that it cannot be pulled over her head. Small dogs, dogs with long backs, or dogs with sensitive tracheas may do better in an adjustable harness for walking. Still keep a collar with tags on for ID purposes, but it won’t have to be as snug if it isn’t being attached to a lead. Check your fence regularly for holes around the bottom or loose boards. You also might want to consider a lock on any side gate so that a stranger could not open it up and let your dogs out. Of course, the safest place for your dogs when you are away is inside the house. If your dog isn’t house trustworthy yet, the investment of a baby gate or exercise pen is cheap compared to a new sofa or carpeting. You also have the peace of mind knowing that your dog is contained in a safe area where he can’t chew electrical cords or get into any other kinds of trouble. Contact all rescues and visit all shelters in your area. It can be a pain, but you will need to visit most of these shelters in person. A commuter may have picked up your dog, or sometimes people will go out of their way to drop a dog off at a no-kill shelter or rescue.Here are a list of shelters and rescues in the San Francisco Bay Area.When going to the shelters, make sure to check all the runs and kennels including the hospital and the Adoption runs. We’ve heard of misguided souls turning lost dogs into local shelters as their own relinquished dogs, thinking they will have a better chance if they go directly to adoptions without a waiting period. Make up posters with pictures and absolutely plaster the area where your dog was lost in a one-mile radius. Also put posters in neighborhood vet offices and pet supply stores. Make sure the words REWARD and NEEDS MEDICATION are on the poster. Anyone tempted to keep your dog may have second thoughts if they think it may get sick. The reward money (unspecified amount) is always an added incentive as well. Besides posters, put an ad in your local newspapers. Usually found dog ads are free, so check all the papers daily. In your ad, describe your dog’s appearance instead of just listing a breed. The person who found your dog may not know she is a Pug, but does know that she is tan, has a curly tail and a cute pushed- in face. Also put Lost notices at all of the local shelters. Include pictures. It won’t hurt to pound on a few doors in the nearby vicinity where your dog was last seen. Handing them a poster and putting a face behind the poster means they may pay more attention to dogs they see on their street for the next few days. Also, kids are a great resource. They usually know the dogs in their neighborhood and are often playing outside or riding their bikes and may be more likely to spot your dog. Talk to the kids (with their parents present of course) and tell them about your lost dog. Show them pictures and tell them there is a big reward. Remember, $20 to a kid is a big reward. If possible, set up a feeding station near to where he was lost. Put an article of clothing there that you have recently worn. He may come back to that area looking for you and a familiar scent may keep him there. Make sure to keep water at the feeding station as this is more important than food. Feed irresistable food; something stinky and canned works well, and feed at the same time every day. Do not include any of these foods…If you do spot your dog at the feeding station, remain calm, kneel down and attempt to coax your dog to you. Your dog may be very frightened from being lost and may not come to you initially. Use hotdogs or something else smelly and palatable to tempt him to you. If you are going to do this, you should probably take the dog to the shelter nearest to where you found her. Chances are that this is also the closest shelter to his home and hopefully his owners will be checking for him there.Most shelters allow 72 hours for the owners to reclaim their dog. Make sure to ask about the policy at the shelter where you take the dog. When dropping off the dog, make sure to keep the receipt given to you. This is your key to finding out about this dog when the reclaim period is up.If the shelter has a Lost/Found coordinator, let them know about this dog as well. The coordinator may have been working with the family who lost this dog already and may be able to match her up with her owners quickly.When you get home, go ahead and place a found ad in your local newspaper. These ads are usually free, and if the dog has been lost for quite some time his family may not be checking the shelters frequently anymore.If you have an interest in the future of this dog, check back in person and find out the kennel number based on the receipt you were given. Do this before the impound period has ended. If you are interested in fostering or adopting this dog, let the shelter know. Most have fostering and adoption programs. If the dog is identifiable as a purebred, you may even want to contact a breed rescue group. Some shelters are great about breed identification and notifying breed rescue groups, and some don’t actively pursue rescue alternatives for a dog. Make up found dog posters. Don’t give out all the information about the dog, leave one piece of information unknown so you can be sure the dog is positively identified. An unusual marking, collar color or anything else that might be unique about this dog will work. Again, don’t put the dog’s breed on the poster, but just describe the dog as best you can. His owners may not know that he is a poodle/terrier mix. Place the posters in prominent areas in a one-mile radius from where you found the dog. Also put up notices in nearby vet offices and pet supply places.Place a found ad in the newspaper. These are usually free.Put a found notice at your local shelter and speak to the Lost/Found Coordinator as well.If you cannot find the dog’s owners and you cannot adopt the dog yourself, contact a local rescue group. If it appears to be a purebred, contact a breed rescue group. If none of these options pan out, you might want to consider taking the dog to a no-kill shelter, such as the San Francisco SPCA. Reunion! If you are fostering a lost dog and his owners have contacted you, make sure they can positively identify their dog. Make them describe their dog fully to you on the phone. Ask them questions to see if they know the missing piece(s) of information you purposely left out of your ads. Ask the dog’s name and see if the dog responds to that name. Ask them for their vet’s name and ask if they have pictures of their dog. Ask as many questions as you need to in order to make you comfortable that this dog really is theirs. Once you have determined that these people may be the owners, set up a time/place to have them see the dog in a neutral location. A local park or vet’s office work well. Hopefully, all will go well and you will be reuniting a much loved and missed pet to his family. If a reward was offered, enjoy it, you deserve it! Or you can always donate it to a local rescue group if you like. If after speaking to the potential owners on the phone you are uncomfortable meeting them in person, contact your local shelter. They may be able to offer suggestions or may allow the meeting to occur at their facility. After all, this is their area of expertise. They will be in a better position legally to determine if the dog’s home is fit. If you are following up on a lead on your lost dog, make sure to bring your dog’s photos and answer any of his finder’s questions. Be mentally prepared that it might not be your dog; especially if your dog is a common breed like a Lab or Shepard mix. If it is your dog – hurray! As exuberant as you may feel, greet your dog gently. He may be mad at you for letting him get lost, or may be a little truamatized from this experience. Gladly pay your reward and if your dog seems to be physically okay, take him home. You can have him checked over by your vet once he has settled back in for a bit. If there are any signs of physical problems or injuries, take him right to your vet. Unfortunately, there are unscrupulous people out there. When contacting someone who may have your lost dog, also have them answer a question about your dog that they could really only answer if they did indeed have your dog. An example would be asking them which foot has a small white marking. The answer may be that there are no white markings on any of her feet. Also, someone who does have your dog may try to get much more than the reward amount from you. This could be considered dognapping, and you should get your local authorities (police, animal control) involved. Getting a dog comes with a lot of responsibilities. It’s like being a parent whereas you need to attend to their needs. Here are some tips on how can you be the best dog owner for the canine friends you have. Learn from these tips and show your buddies how lucky are they that you became their friend. Before you get a dog, it is important if you can research the facts first. It is essential for you to know the best type of dog that will be suitable for your family. For example, if you have kids at home, the kind of dog you should get is the kind of canine that is good with children. We have all heard a lot of cases whereas the dogs are being brought to shelters because of a behaviour issue. As the owner, it is important that you will be able to train your dog to avoid such problems. The bad habits can be corrected, but it should not be left that way for a long time because it will be their attitude towards things. The rules should already be straightened out even before you bring the dog home. Creating discipline with your canine pal is necessary. There may be rules, but one thing all of us should remember is that the rules should be consistent. It can’t be that one is a spoiler and only one is the disciplinarian. It can cause confusion. If you can follow these tips, there is no doubt that you can be a great dog parent for your little canines.